Where is your clipboard located on Mac? How to view clipboard history? How to use clipboard to its maximum potential? You won’t have to worry about all that anymore – just keep on reading. Whether you are a student, or an office worker, or a freelance writer/coder/molder – I believe you know pretty well what “copy-paste” is. All of us do these 2 basic computer commands at least once in a while. Many use those repeatedly every day. Thus, what can you do when there are loads of text you have to copy and paste regularly all around? When you need all kinds of info to be taken from somewhere and a bit later inserted elsewhere. When your standard Mac clipboard just isn’t enough. How can you improve your copy and paste on Mac? Our answer is simple: try Unclutter Clipboard. Unclutter Clipboard is one of three panels inside Unclutter productivity app. The tool’s name is rather self-explanatory – it is a clipboard manager for Mac which stores what you copy and lets you paste what you choose from that. You can view clipboard history, edit your clips, save favorites and many more. You can switch between a single clip or list view – with just one click, or a pinch-zoom gesture, or Ctrl + Shift combination. There are also two modes: History and Favorites. Switch smoothly between them with horizontal swiping or clicking on a respective icon. So how do you copy paste on a Mac with Unclutter Clipboard? Copy something – a text snippet, link, picture, video, doc, you name it. Repeat dozen times more, if needed, or do some other things on your Mac. Open Unclutter and click on the item you need from Clipboard History. Paste it to the final destination. Basically, that’s it. As for starters. 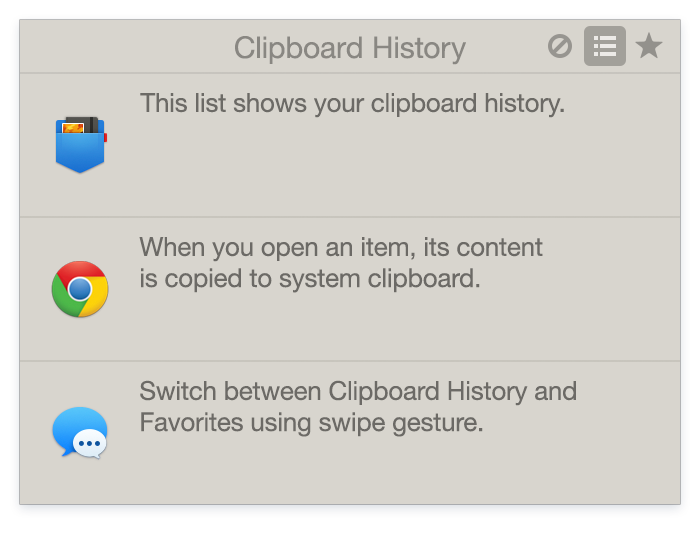 Our handy clipper app automatically records everything you copy in clipboard history in the chronological order. Its vault keeps up to 50 latest copied elements which stay there even after Unclutter relaunch or system reboot. Unclutter Clipboard won’t let you lose some useful piece you copied a while ago (or waste your time trying to find the place it was copied from). Anything you may need to paste you’ll find in that Clipboard History. After all, you can always simply check what is currently copied in the system clipboard. That’s to make sure you’re about to paste what you intended to. And to avoid awkward situations – like sending something inappropriate to your boss or else. 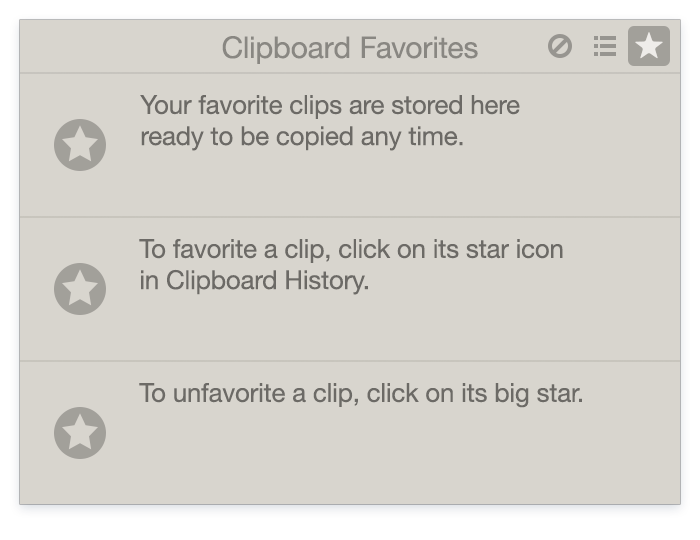 Clipboard Favorites is a separate list for keeping the clips you use most often. To add an item to this list, you click on its star icon in Clipboard History. The item stays in Favorites unless you unstar it. It may be your favorite phrase, an often-used hyperlink or email, a funny picture for a friends’ Facebook chat – or anything else you share a lot. 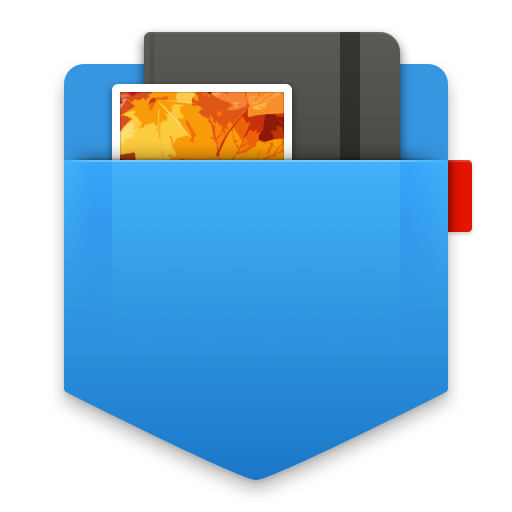 This is quite similar to what we have in Unclutter Files panel where you can store your most frequently used files and folders. When you choose an element from the list, it opens to show itself in full and immediately gets copied in your Mac clipboard again. What’s more, Unclutter even lets you edit the content of a text clip. Click on it and make some edits. After you finish, the updated text is ready for paste. Have you heard anything about “sensitive data”? Well, in our case, it includes your passwords, ID numbers, personal and private info, etc. When you copy this kind of data you don’t want it to display easily for everyone. Unclutter Clipboard recognizes such sensitive data and disguises it with dots. So, you can feel safe from others’ eyes passing your Mac screen by. Besides, in settings, you can specify those apps the data of which is to be considered as the secret one. Such data won’t be visible in Clipboard History – but it will be hidden in the app’s memory. Here is just one cool way of using Clipboard, when you have loads of material in a need to be copied. Imagine a big report you have to retrieve the most important data from and use it later in your project. Instead of performing endless copy-paste action with constant windows switching, you just copy all the useful chunks of info to paste them later in the required order. Unclutter Clipboard is there to make it possible. Ideal for those preparing a synthesis report, analytics summary, master thesis or anything in that manner. So, here is one nice solution of how to properly copy and paste on your Mac. 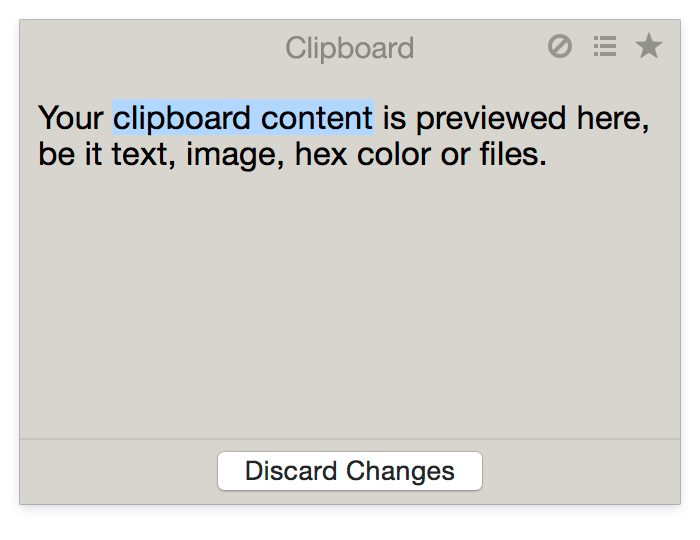 With Unclutter Clipboard, you can easily access your Mac clipboard and do whatever you wish with those copied snippets. Browse copy paste history, recall any clip you need, pick out favorite ones – fast, simple and effective. Now, you can finally stop wondering where your copied data is or how to manage it. Our straightforward pocket clipboard tool will take care of this. And that is what makes Unclutter Clipboard probably the best place for keeping and using your copy paste stuff.